The Ambassador Seed is produced with Isabella’s well known Isacryl 295g/m2, a durable, breathable, fibre-dyed acrylic material. The Ambassador Seed has a mosquito net in each side, with zipped cover, providing a pleasant indoor climate on sunny days. A range of optional extras are available to enhance your awning. In the event of an issue with your item, we aim to reach a resolution within as little time as possible and with the least inconvenience on your part. Please contact us regarding the condition of your item, following a full inspection within 14 days of purchase. Introducing the Isabella Ambassador Seed, a 250 cm deep awning. The Ambassador Seed has a modern design, in colours of Granite, Steel and Seed, with frosted lower window panels and a coated sand colour roof material to provide a soft warm environment. 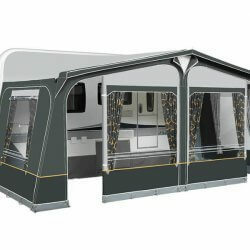 The awning is supplied as standard with Set of curtains Cube Creme, veranda pole, draught skirt, wheel arch cover, FixOn, Typhoon storm sashes, awning bag, pole and peg bag incl. peg remover.